Rich people of the world live on ‘Elysium’; a paradise whereby there is no sickness and what appears to be immortality. The “rest” live on Earth. Niell Blomkamp (of District 9) returns to his allegorical sci-fi roots with Matt Damon leading this gritty action romp. Unfortunately, insights into social and class mobility are limited as the hyper-technological and divided world is merely a backdrop to a simplistic story of a psychopathic henchman (Sharlto Copley) – shock horror – not following orders. 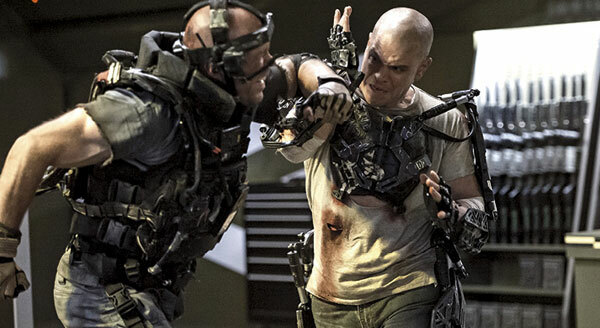 Damon’s “Max” fights for the survival of his childhood sweetheart, Frey (Alice Braga), and her daughter – so those on Elysium are not the primary concern. Jodie Foster, protecting Elysium from the inevitable Earth-dwellers trying to access tip-top health-care, has so much potential – but it is secondary. Brutal injustices seem rooted in truth – so it’s heart-breaking that Blomkamp fails to ensure that the story carries the same weight.